Hyderabad is the capital of Telangana and is one of India’s most progressive and historical cities. As such, it offers many attractions and things to see and experience for the everyday tourist. The city is rather big so people who are planning on seeing all Hyderabad has to offer would do well to invest a few days to see the main attractions. The good news is that there are many ways you can go about getting around the city. Each one has its own pros and cons and it will really depend on your style of travel and preference. By Foot. Like most cities with a rich cultural history, Hyderabad is a very good city for walking, especially if you focus your rounds in the Old City. Walking by foot can be tiring but as long as you have a good set of walking shoes or sandals, you shouldn’t feel any discomfort. Note that walking can also have its hazards, especially in the Old City. It is not uncommon to see roads without pavements and oftentimes, bikers will go right up to the edge of the road and over any barrier in order to get any advantage over everyone else. Crossing roads can also be very dangerous; it is recommended that you always use the foot bridge. It is also easy to get lost in a big city like Hyderabad so be sure you have your city map with you. Lastly, in a city that has more than 5 million people, it is always prudent to keep an eye out on your things. By car. Unfortunately for motorists, driving around in Hyderabad is worse than in the rest of India, and India doesn’t exactly have the best driving discipline in the world! More often than not, there are long stretches of roads that have no median breaks so vehicles usually just drive on the wrong side. Keep in mind that these roads pass through thickly populated areas. If you can get over these cons, however, there are several car rental agencies such as Savaari Car Rental, Hertz Car Rental, and Enterprises Car Rental. By taxi. Metered taxis are available but they have to be called in from a centralized call center for booking; since demand far outstrips the supply, getting a taxi off the street is almost impossible. Most taxis charge 10 Rs per kilometer and in most cases, the minimum charge is 80 Rs. Taxis are better for long distance traveling as there are taxi services that refuse to go short distances. By bus. Hyderabad has a good bus line that is run by the APSRTC which, in turn, is owned by the state-government. Most buses start and end from the Secunderabad Railway Station, Nampally Railway Station, Charminar, and Koti. There’s also the Metro Express and the Metro Deluxe if local buses are not your thing. Buses run point to point so you are assured of getting to your destination quickly. By train. Hyderabad doesn’t have a full expressway system but local trains are available in some places, called the MMTS (Multi Modal Transport System). Around 84 MMTS trains run up and down the city daily to provide transporation services to the people, servicing around 75,000 people on an average day. The MMTS has a website you can check online for routes and schedules. By autorickshaw. For short trips within the city, the autorickshaw is far and away the best option you can have. An autorickshaw is a yellow, three-wheeled vehicle that has a canopy. A driver sits in the front while the passengers sit behind. They are metered and charge by the kilometer, which is always at a cheaper rate than taxis. 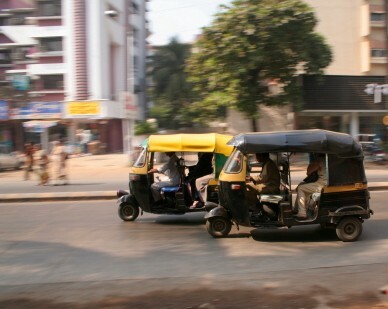 Autorickshaws are available almost anywhere in Hyderabad so getting one wouldn’t be a problem.